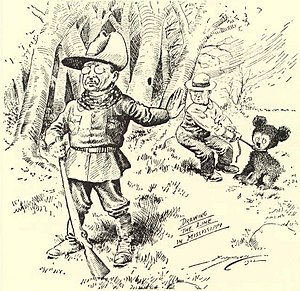 The association between bears and humans goes back millennia and while bears were hunted for their meat and fur, they were also hunted as a test of “manhood”, “strength” and “bravery” among men with clearly nothing better to do and not a lot happening between their ears. In Germanic culture bears were honoured for being a symbol of the warrior class and this filtered through in language. In Old English for example the word “beorn” has twin meanings, standing for both warrior and bear in equal measure. In Nordic cultures men were and are to this day often called Bjørn or Björn, which also means bear. It’s quite a common name and, coming from Northern Germany, I knew a quite few Björns when I was growing up. There are various rune stone inscriptions mentioning the name, so it was already popular, when the Vikings were around. Legend has it that some people even have the ability to transform into bears – which makes this an interesting animal to feature in Willow the Vampire’s next adventures. According to legend, warriors dressed in bear-skins could take on some of the bear’s most important characteristics, namely power, stamina and strength, all useful things in battle and when dealing with new, devious headmasters. 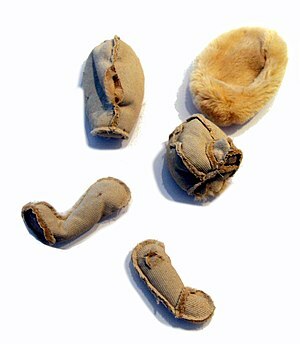 The bear-skins were treated with herbs and oils, presumably in a magic ceremony. The English word “berserk” is allegedly referring to this ability of transformation. When going into battle, such bear-skin wearers would feel “invincible” and therefore fight to the death without wasting a thought on injury or harm to themselves. People believed such warriors could even walk through fire, which just goes to show how silly human beings really are – no self-respecting bear would believe such utter nonsense. Early Greeks also believed that people could take on bear characteristics and that the gods could sometimes transform people into bears. Perhaps it was inevitable that humans should adopt the bear as their favourite toy. 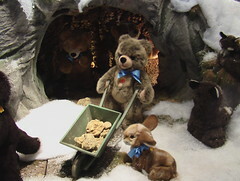 Steiff teddy bears are without doubt the most famous representative of this sub-species. 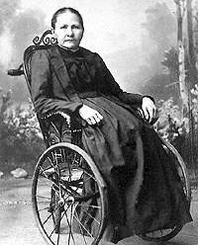 The company was founded in 1880 by a little old lady called Margarete Steiff, who took in her brother Fritz as a business partner a few years later. She originally made elephants, not bears, and they were not designed as children’s toys but to be pin cushions which Madge sold to her mates. When you purchase something from their shops in Germany, you’ll receive your toy in a lovely paper carrier bag that shows a drawing of the elephant on wheels, which Madge initially designed. When she realised how much these elephants appealed to children, she started making all sorts of different animals for kids. The prototypes for Steiff elephants, cats, dogs, goats, pigs and hedgehogs were all designed and mostly made by Madge herself in a back parlour and later a small manufacturing place. Eventually her nephew Richard joined the company in 1897 and created the typical Steiff teddy bear in 1902. 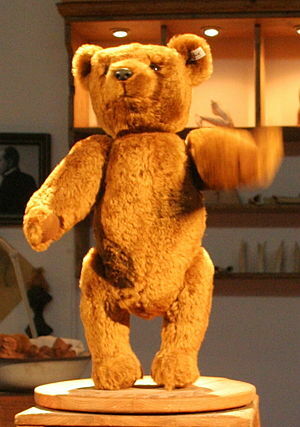 The bear design was so successful that by 1907 the Steiff company was already selling just under one million teddies. Margarete created the company’s motto and it is still holding on to it to this day: “only the best is good enough for children” and I sincerely wished every single person on the planet would follow this motto! There are few manufacturers in the world who strive to make products that come with a lifetime guarantee – we think of Swiss luxury watches or cars like a Rolls Royce when we hear of such high production values. Yet, this is exactly what happens at Steiff, where each toy is tested to its absolute limits to ensure no child is harmed, no matter how much love the teddy bear or other toy is being subjected to over the years. Eyes and the characteristic metal “button” in the teddy’s ears must not come off through wear and tear; all materials used must undergo rigorous testing for their ability to withstand fire, water and far too many cuddles to reproduce by a machine. Unfortunately, they hadn’t thought of children like me back in the 1960s, when they tested their bears – I put my Steiff bear into a cement mixer (hey, it looks a bit like a washing machine!). The poor creature lost most of its fur, but he was still my favourite toy and once helped me to run away from home…I was about three and folded him up, climbed on his broad back and legged it across a fence that was meant to keep me safely in a garden. 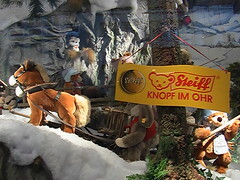 There’s a Steiff Museum, http://www.steiff.de, in Giengen/Brenz, just off the A7 motorway. I think Nuremberg is probably the nearest airport. Bookings must be made beforehand online; the site is available in several languages, including English. Castle Katzenstein is nearby, which is also worth a visit (http://www.burgkatzenstein.de/allgemein_geschichte.php?language=en). Burg Katzenstein dates back to the 12th century and is a fun day out for all ages, certainly the type of place Willow and her friends would enjoy – not to mention Willow’s four-hundred-year-old dad Dylan, who’d be familiar with the type of costumes the staff wear at Castle Katzenstein! Bears, it seems, have their own way of dealing with humans and below you’ll find a few links to videos that show the bear vs. human situation doesn’t always end in nasty humans winning the upper hand; sometimes bears have the last laugh, and quite right, too! I love Madge’s story – how inspirational is that lady, I ask you? Madge is going to be my up and at ’em girl. When I’m feeling truly cheesed off – I’m going to think of Madge – way to go! Yes, it’s a remarkable story, given the times she lived in. I’ve not been to the museum, I discovered too late that there’s some coach service going there…ah well, next time I go to Nuremberg.